Winsource takes jab at #TeamBlackBerry | BlackBerry Blast! Back on New Year's Eve, RIM asked its users on Twitter how they planned to Be Bold in 2012. 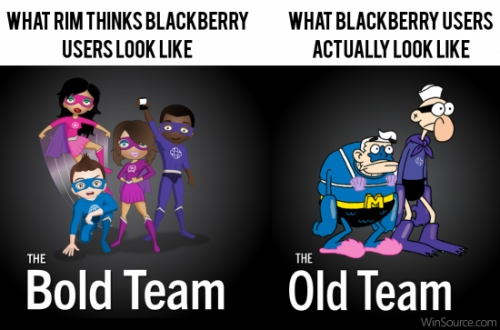 They received more than 35,000 responses and decided to share the data with an infographic introducing four characters as #TeamBlackBerry. Some folks found the graphic humorous and it's been getting a lot of play around the web over the last few days. Winsource decided contribute their own view of #TeamBlackBerry. The graphic says it all.